It was a Saturday morning in late November and I had an impressive hangover and a freezing cold apartment. I was sitting on my couch flipping through the channels trying to find anything to do besides homework Howard The Duck and Hellraiser XXII just weren’t looking like good prospects when I suddenly realized that I had an assignment to do for AudioXposure. I went to my email and apprehensively clicked on the link my editor Jenn had given me to this artist Phredley’s web page. The songs this acoustic angel had to offer immediately alleviated my own cranial cramping and defrosted the bitter cold coursing my body. I started picturing colorful drinks with umbrellas. I pictured white sands and blue waters. 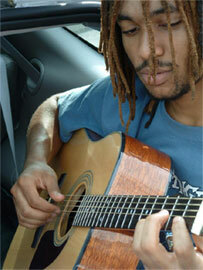 I pictured Phred jamming out with Jack Johnson. I saw John Mayer stealing riffs, and Tracy Chapman considering a comeback to record a duet. And I heard the smoky, placid, confident voice of a raw Ben Harper. When my roommates got back from whatever excursion they had been on that morning, I told them to get out their cigarettes, grab a beer and sit back and relax because I had some tranquil and otherwise seamless music for them to listen to. 3 songs later, I – we (my roommates need to be included) – knew this kid was talented. Zach: How long have you been playing music? Phredley: I’ve been playing music my entire life. My mother is a music teacher, so she started teaching me piano when I was 3. I was able to pick up more instruments on my own and in school concert bands… I play 16 instruments now–piano, guitar, drums, bass, soprano and alto saxophones, trumpet, trombone, tuba, harmonica, organ, mandolin, banjo, violin, clarinet and flute. Zach: When did you start getting serious about making music? Phredley: It’s always been serious for me. There isn’t anything I take more seriously. I started writing music to perform when I was about 16. Before that there were lots of piano instrumentals that I’d sketched out just to play with. Towards the end of my senior year I started going out and playing open mics, sitting in with bands at some bars downtown (Detroit) and doing my own shows. I play in 6 bands now, which hasn’t left me a lot of time to focus on my own project, but after the new year that’s going to change. I’ve been doing a lot of writing. Zach: Who has influenced you (yes I know this is cliché but necessary)? Zach: You can find three of the tracks from you EP at www.purevolume.com/phredley. Are you working on anything new? Phredley: I’ve been trying to get this full-length out for a while, but I’ve been so busy that it’s hard to find time to work on it. I’m doing all the instrumentation and it’s full band, so I’m trying to pull all the stops out, but it’s hard because a lot of the time there’s nothing to bounce my thoughts off of. I haven’t been able to spend much time in the studio. There are a lot of ideas I need to get out and listen to so I can make some adjustments. It just takes time. I’m shooting for a February release. Zach: What’s on the table for you in the near future? Phredley: I gotta get the CD out, and I’m working on a music video for the single “Thinking” right now. That track is available for download at www.myspace.com/phredley. I want to do a nice size CD release party, and then after that I’d like to start gigging, maybe 5 nights a week, save up, push the new CD. Zach: What celebrity deserves to be flogged in the middle of Times Square? Phredley: Whoever needs the publicity the most. Listen to this kid. If you want, nay, if you need, to get away from that overproduced junk thrown at you, then here’s a good start. It’s just a man and his guitar playing from the heart – because that’s all he’s got to go on. It’s gorgeous, raw, and hints at a future brilliance. He might not reinforce your own musical talents, but that’s only because he’s that much more talented. You can also check out Phredley at www.Phredley.com.